We hope you enjoyed your rental period, if you are about to order, find our here how to rent pocket wifi in Japan. Here is a list of airport locations where the Mobile Wifi can be returned. Please return the Wifi router and all included accessories, such as cover, charger and USB cable. The return location can be found at: the QL Liner Counter in both the North & South Wings 4F, open between 7:00 AM ~ 9:00 PM. The return location can be found at:International Departure Lobby Counter on the 3F, look for the QL liner counter. Open between 7:00 AM ~ 9:00 PM. Between 6:30a.m. ~ 11:45p.m, please return to Wifi router at the Global Wifi counter on the 2nd floor. Outside of this period (11:45p.m. ~ 6:30a.m.) please return the Wifi router at the JAL ABC Counter on the 2nd floor. The return location can be found at the Meitetsu Travel Plaza. Look for the Global Wifi counter. The return location can be found in front of the restaurant next to the North Entrance of the International Terminal 1F. 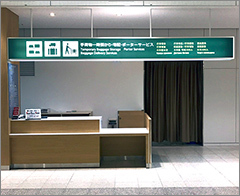 The return location can be found at: Baggage Storage counter located in the domestic terminal. Open between: 9:00 AM ~ 9:00 PM. 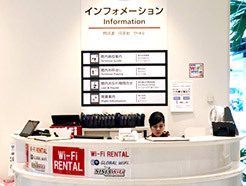 The Wifi router can be returned at the AVI Bisho Airport Store, in the International Terminal Departure Lobby 2F. Open between 7:30 AM ~ 6:00 PM. The wifi router can be returned at the Domestic Arrival Lobby 1F, please use the Global Wifi return box. Open between: 7:20 AM ~ 7:45 PM.